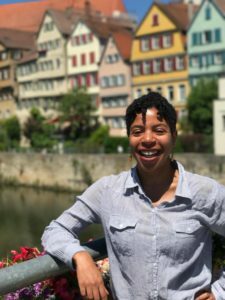 Jamele Watkins is a Post-doctoral Fellow in German Studies at Stanford University. She has affiliations with the Center for Comparative Studies in Race and Ethnicity and Feminist, Gender, and Sexuality Studies. She researches topics in the intersections of race in gender in contemporary German society. Her current project examines East German fandom around Angela Davis.